66 FLEX007 MAGAZINE I JULY 2018 Flex Talk: E-Textiles—The Wild Frontier E Tara Dunn recently sat down with Connie Huffa, textile engineer and principal of Fab- designs. Her current work is focused on pho- tovoltaic, conductive and smart fabrications. Connie shared some thought-provoking e-tex- tile applications and her experience in this developing market. EIPC 50 th Anniversary Conference Day 2: The Past, the Present and the Future, Pt. 1 E Speaker Micha Perlman of Orbotech predicted that automotive electronics would place new demands on the PCB industry: HDI was pre- dicted to grow from zero to over 15% of the total HDI market by 2020, high-power systems would require heavy copper, and flex and flex- rigid harnesses would replace conventional wiring. Flexible Substrates Market Worth $775.8 Million by 2023 E The flexible substrates market is projected to grow from $402.9 million in 2018 to $775.8 million by 2023, at a CAGR of 14% from 2018 to 2023. The growth of the flexible substrates market can be attributed to the rising demand for flexible displays from the electronics industry. Flex Time: Why is Rigid-Flex So Expensive? E One question that I hear fairly often, particu- larly after an initial quotation, is "Why is rigid- flex so expensive?" In this article, I'll share with you the cost drivers in rigid-flex relative to standard rigid boards and flex circuits with stiffeners. A typical rigid-flex PWB will cost about seven times the cost of the same design on a hard board. Why? All Flex Introduces Thermal Controller E The AFTC-5000 utilizes a single-button inter- face providing both OEMs and end-users with the ability to easily adjust the thermal settings. The controller provides six temperature setting increments that are pre-programmed by All Flex per the customer's specific requirements. 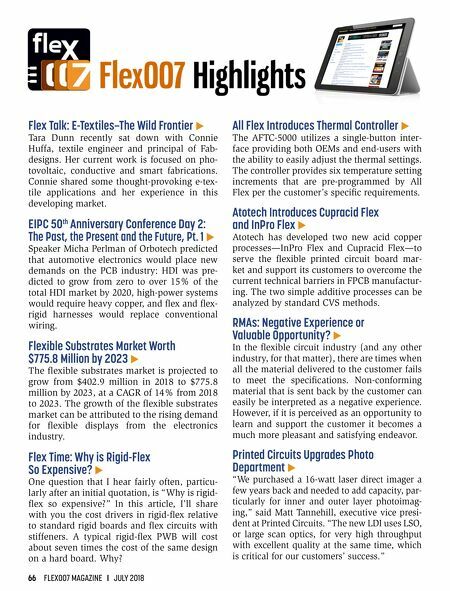 Atotech Introduces Cupracid Flex and InPro Flex E Atotech has developed two new acid copper processes—InPro Flex and Cupracid Flex—to serve the flexible printed circuit board mar- ket and support its customers to overcome the current technical barriers in FPCB manufactur- ing. The two simple additive processes can be analyzed by standard CVS methods. RMAs: Negative Experience or Valuable Opportunity? 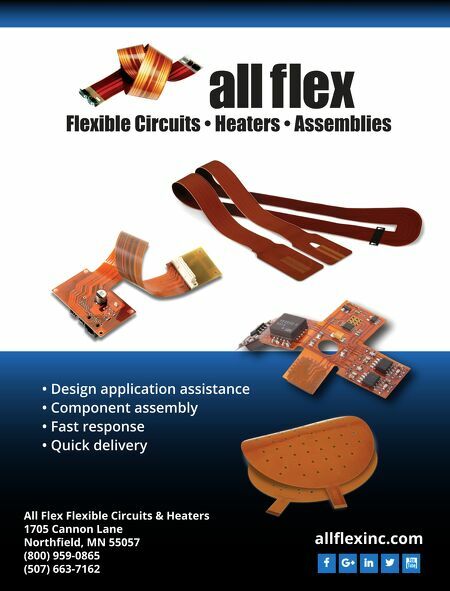 E In the flexible circuit industry (and any other industry, for that matter), there are times when all the material delivered to the customer fails to meet the specifications. Non-conforming material that is sent back by the customer can easily be interpreted as a negative experience. However, if it is perceived as an opportunity to learn and support the customer it becomes a much more pleasant and satisfying endeavor. Printed Circuits Upgrades Photo Department E "We purchased a 16-watt laser direct imager a few years back and needed to add capacity, par- ticularly for inner and outer layer photoimag- ing," said Matt Tannehill, executive vice presi- dent at Printed Circuits. "The new LDI uses LSO, or lar ge scan optics, for very high throughput with excellent quality at the same time, which is critical for our customers' success."